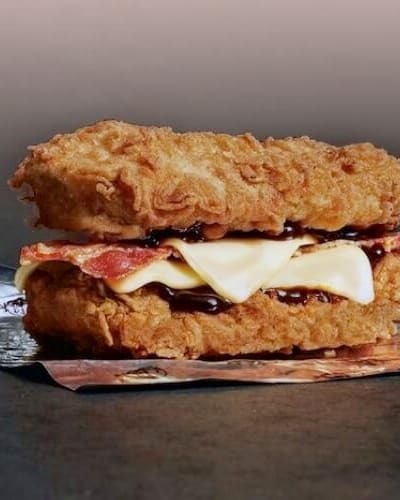 The Double Down by KFC is a fan favourite. And as of October 2017 it has hit the shores of the United Kingdom too. It is a truly global hit. There is just something about having two chicken fillets surrounding bacon and BBQ sauce. Delicious! We are going to start our Double Down recipe by preparing our chicken fillets in a very similar way to how we do in our KFC Zinger Burger Recipe. You can find that recipe here if you fancy a touch more bun with your chicken burger. Start by slicing your chicken breasts, (only if they are two large). You need them roughly the size of your hand. Flatten your breasts until they are roughly half the height of their original size. Then in a bowl, marinate your chicken breasts using the salt & pepper, mustard powder or all spice powder and Worcestershire sauce. Leave this to sit for approximately 4 hours. In the mean time start to prepare your batter by beating an egg and 2 tablespoons of water. Put this to one side, ready for when we cook the chicken. Now comes the time for cooking the chicken, the good bit! Remove the chicken breasts from your marinated container/bag, and coat them liberally in the flour. You want to ensure you get a thick coating as this will help them crisp up. Then remove from the flour and dig them into the egg, coat lightly, and repeat with the breadcrumbs. You should end up with a chicken breast which has been coated in flour, then egg, then breadcrumbs. Once fully coated, deep fry your chicken breasts on a medium to high heat (350°F or 175°C) for around 13-15 minutes, until golden brown on all sides. We use a small table top fryer for this, but you can easily use a large frying pan and cook for 6-7 minutes on each side. While cooking the above, set up a second frying pan, and cook your bacon in a small level of oil. Fry this until crispy. Once both the chicken and bacon are cooked, place the chicken on a grill pan, and layer up the Monterey Jack cheese slices, then the bacon. Cook this in an oven at 350°F (175°C) for 5 minutes. Once cooked, remove from the oven and allow to stand and cool on a sheet of baking paper for 30 minutes. If you’re too hungry to wait 30 minutes, then break out your knife and fork and get stuck in. If you would like a traditional hand held Double Down meal, then pour yourself a drink and relax for 20-30 minutes. Finally assemble your Double Down burger. Start with your bottom chicken breast, a healthy dollop of BBQ sauce, then top with your second chicken breast.